Potted Crassula ovata, commonly known as Jade Plant, Friendship Tree, Lucky Plant, Money Tree or Money Plant. Crassula ovata is a succulent plant with small pink or white flowers. It is native to South Africa, and is common as a houseplant worldwide. Jade Plants are evergreen plants with thick branches and smooth, rounded, fleshy leaves that grow in opposing pairs along the branches. Leaves are a rich jade green; some varieties may develop a red tinge on the edges of leaves when exposed to high levels of sunlight. New stem growth is the same color and texture as the leaves, but becomes brown and woody with age. Under the right conditions, they may produce small white or pink star like flowers in early spring. Commonly known as Jade Plant, Friendship Tree, Money Tree, Lucky Plant or Money Plant. Small pink or white flowers. The plant you will receive is growing in a 6″ pot. The Jade Plant is a succulent and one of the easiest to grow houseplants that you will find. They look great in any setting in your home or office. The Jade Plant is often pruned to become a Bonsai Jade. It is as easy as pinching or pruning off the leaves or branches you want, to design the plant to look like a miniature tree. It is so easy that the Jade Plant is often suggested as the first plant a beginner should try when they want to grow a Bonsai Tree. Jade Plants will still thrive even when growing in very shallow pots so they do well in dish gardens. They work well in containers outdoors as long as they are not in full sun for most of the day. Almost any soil will work but a good quality cactus and succulent mix is ideal. Jade Plants are easy to propagate from cuttings. Crassula ovata, Jade Plants are toxic to cats and dogs. If you have animals that like to nibble on plants it would be better to get the Dwarf Jade Plant, Portulacaria afra which is not toxic. 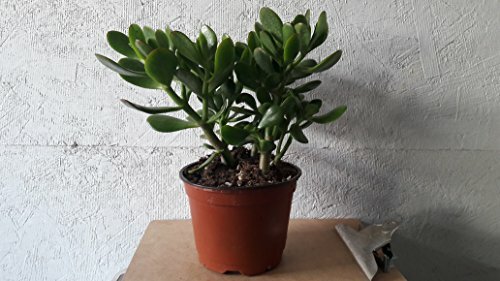 The Dwarf Jade Plant looks very similar but has smaller leaves. Over time, as the Jade Plant grows it may become a little top heavy so be sure to put it in a sturdy pot. Jade Plants are a wonderful succulent that look great and are easy to grow and maintain. Click through to see 5 more photos of the potted Jade Plant.